Caltrans employee Gilbert Garcia prepares the embankment next to the Interstate 5 bridge over Oceanside Boulevard for new plants in Oceanside. 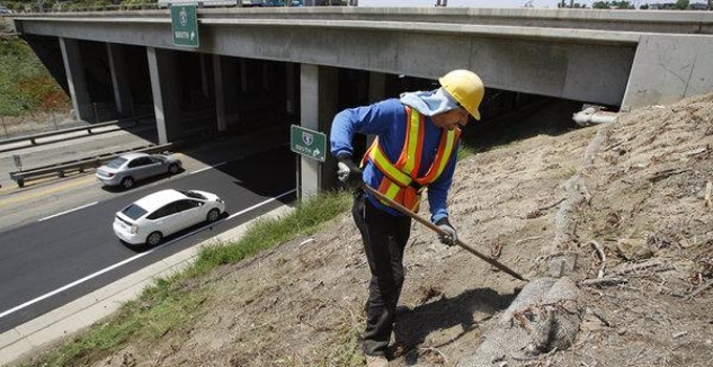 Caltrans halted maintenance work statewide after the death of a worker Monday in San Diego. Richard Gonzalez, 52, of San Ysidro was the third Caltrans worker to die on the job since May. Caltrans officials called a "statewide safety stand down" in an effort to stress safety. "Every day, highway workers put their lives in danger just by going to work," said acting Caltrans Director Malcolm Dougherty in a statement. "These three tragic incidents are sobering reminders that we all must do everything we can to keep our highways safe. Motorists must slow down, watch out for highway workers and safely move over a lane when passing work crews." Caltrans officials said regularly scheduled highway maintenance activities will be temporarily halted. Notices will be posted on electronic highway signs. Gonzalez was picking up trash on northbound Interstate 15 at the eastbound State Route 94 on-ramp just before 9 a.m., Monday when he was struck by a car. The driver of a Cadillac swerved in an attempt to avoid Gonzalez, but struck him with the right front of the car. On May 4, Stephen Palmer Sr. died in National City. On June 7, Jaime Obeso, 53, was struck and killed along eastbound Interstate 8 in Imperial County. In January 2007, it became illegal for drivers not to either move over or slow down when they approach a marked Caltrans vehicle with its warning lights on. In 2010, state law was expanded to require drivers make a lane change away from emergency vehicles along the shoulder. If a lane change isn't possible, law requires that drivers slow down to a "prudent speed."